It has known that from many blogging platforms WordPress is the best platform. Within a short interval of the time, we are provided with a new version of WordPress. There are many plugins which don’t work properly when we upgrade our WordPress. In this situation, we need to downgrade WordPress. To downgrade WordPress version we need to know the proper procedure because it can effect our blog if we do any mistake. How To Downgrade WordPress Easily And Correctly ? The question to downgrade WordPress version has asked by many beginners. For newbies, it’s hard to do any disturbance with their blog without having any proper knowledge. It’s really important to know about all the steps by which you can downgrade WordPress. I am going to tell you some simple steps by which you can downgrade any WordPress version to its previous version. Step 1 :- Firstly you need to download the WordPress version which you want to use or downgrade to. It’s easy to download WordPress as it’s free. You can simply visit WordPress.org and choose your WordPress version to download. Step 2 :- Now you have to login to your present WordPress version. 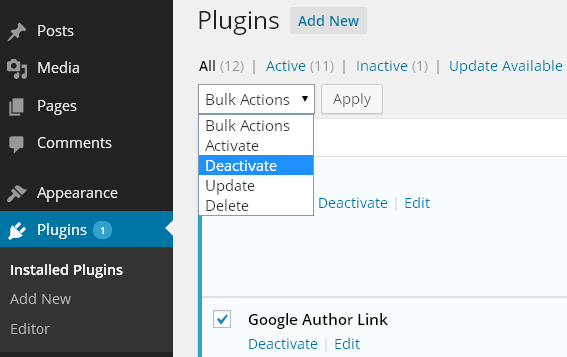 Click to plugins->installed and doing the bulk action for the deactivation of all the plugins which you have installed. Step 3:- The third step to downgrade WordPress version consists the login to your web host cPanel. 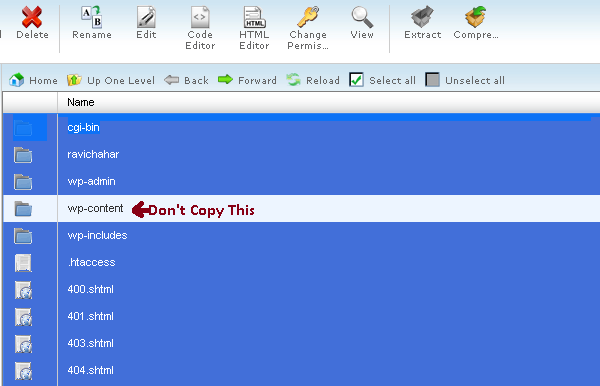 After login to your control panel, you have to open your file manager where you will find public_html. 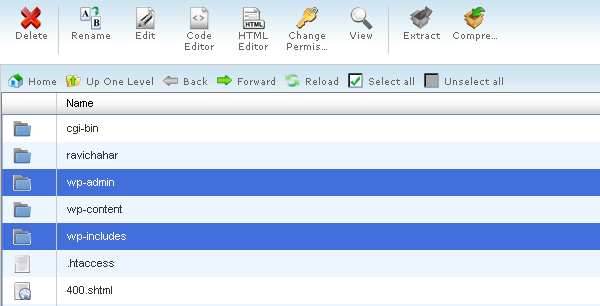 Now you have to delete two folders from it named wp-admin and wp-includes. You don’t need to delete all other folders because they will be over-written when you will copy new files. Step 4 :- This is an important step which you have to remember. Don’t delete the wp-content folder. It contains many useful files after deletion of which there can be the problem. Keep in mind to keep this folder safe. Step 5 :- Now it’s time to overwrite all the files except wp-content by uploading the WordPress version at which you want to downgrade, the WordPress version which you have downloaded in your computer. Copy all the files except wp-content. Your all the files of previous WordPress version will be replaced by your new WordPress version. Step 6 :- After the completion of all these steps you have done your job successfully. Now when you will try to login your WordPress you will see any login page. A message will be appeared in front of you for the confirmation to upgrade your WordPress. Actually it’ downgrading but for them, it’s the change so they will show this message. Just click to continue and enjoy your’s choice WordPress version. Step 7 :- Now you can login to your new downgraded WordPress version and activate your all the plugins which you have deactivated. After the completion of all the steps explained above anyone can downgrade WordPress version to its previous version. Many people think that why we need to downgrade WordPress? As I have explained above the main thing to know about the proper working of all the plugins. There are some plugins which don’t work on the latest version of WordPress. As happened in the WordPress version 3.9. Do You Have That Determination To Become A Famous Blogger? DoFollow And NoFollow Link : Which And Where To Choose? I think that with the update of version 3.9 is the first time I’ve heard of a lot of people having serious issues with it. If you must know the truth, I didn’t upgrade it! I usually wait about a week anyway just to make sure that whatever bugs they have were addressed. Several of my friends complained of not being able to post and the colors not being right, etc. I felt that it might be an issue with our theme and although I don’t have a lot of plugins I wasn’t taking the chance. I felt that because there were so many problems that another version would soon be out and sure enough it was. This is good to know though because had I upgraded and had those problems I would have wanted to fix it quick. Thanks for sharing this and I’ve never had to do it but you never know when I might. Yes in the version 3.9 there are many problems. There are many plugins which don’t work properly. I had updated to WordPress version 3.9 then I came to know about such problems. It’s better to keep our old version installed until we are provided with any other secure version of WordPress. Thanks for your precious comment as always. Thanks for sharing this guide. It’s really a helpful guide, the screenshots added by you made this post easy to understand. Thank you for taking us through this step by step “downgrade” of WordPress. I never upgrade when something new comes out because there will always be a problem of sorts. I like to wait a while and see. Then I notice what works and what doesn’t. Most of the time I notice that certain plugins won’t work with an upgrade. I never thought of downgrading, but this sure comes in handy if I need to do so. With things changing all the time, one never knows when this is needed. Thanks again for explaining this. Actually after the upgrade version 3.9, people have become so much concerned about it. There are many plugins that don’t work in this version. Hope you wouldn’t need to do that. It’s better to check before upgrading. Yes, just as Adrienne mentioned, we need to be wait for a week before upgrading it, and I waited a few days too, but found many issues myself, and had to contact support, but they normally take their own sweet time to get back to you and by that time, many others might have complained so those issues were resolved. I have no idea about the way you mentioned to do it manually and would surely check it out, just in case we get caught up sometime. There is nothing to be sorry about. The way I have mentioned is easy to implement. I have done it myself to downgrade from WordPress version 3.9 to 3.8.3. I wish you wouldn’t need to face such problem. It’s better to use old version than to face problems. Thanks for your visit. Enjoy the day.